Extra! Extra! Read All About It! The New York Times is now available online! Don’t miss out! Need to write a speech on an event that happened on your birth date? 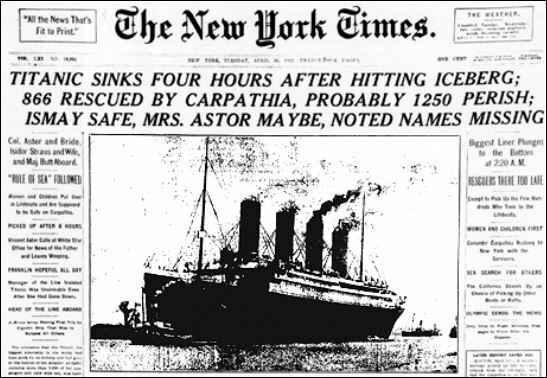 Explore over 150 years of breaking news stories from the renowned New York Times. Read about the sinking of the Titanic, where more than 1,500 people perished in the icy waters of the North Atlantic Ocean on April 15, 1912. Or if sports is more your thing, read about the New York Yankees 5-3 win o ver the Brooklyn Dodgers in the first World Series game ever broadcast on television on September 30, 1947. This event was so ground breaking a judge stopped a trial for jurors to watch it on TV. Whether you’re looking for a specific event or just want to browse, The New York Times: Historical Newspapers (ProQuest) has it all, from the very first issue printed in 1851 all the way to 2010. Articles are in PDF so you can view them as they originally appeared. Just select the link from the library’s database page and have fun exploring! For more current articles, be sure to search The New York Times (Gale) from 1985-present.